Enriched with fair trade Shea Butter (10%), this Shea Lip Balm helps to moisturize, nourish and protect dry lips. The comfort, suppleness and softness of your lips will be fully restored. Apply as often as necessary depending on how dry your lips are. L'Occitane Natural Shea Ultra Rich Lip Balm is a good item to be used in cold season due to its dense texture. 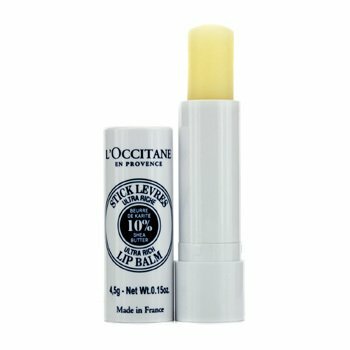 The balm itself is a solid stick yet it melts and glides over the lips upon application. The scent is subtly sweet (almond-like) but it is not cloying or distinct so it can be used by both women and men (my husband uses it when his lips start to dry due to a frosty weather). The packaging is neat and durable - not once it had cracked or opened by its own volition. The balm can also be used, surprisingly, for softening the elbows. The price is a bit high for the offered volume, and the balm itself has to be re-applied once in two hours, but despite these two downsides the balm is a nice protective beauty treat for the winter.